We’ve talked about Adrenaline Amusement’s Tomb Raider arcade game on several occasions this year. The cabinet, which was released at the beginning of 2018, received a massive launch; and by massive, we’re not talking only about the reception. The cabinet itself is enormous—about 120” across. While this game is ideal for Family Entertainment Centers who have enough real estate (and money) to accommodate this beast of a cabinet, this is not the case for collectors who also happen to be die-hard fans of the game series. 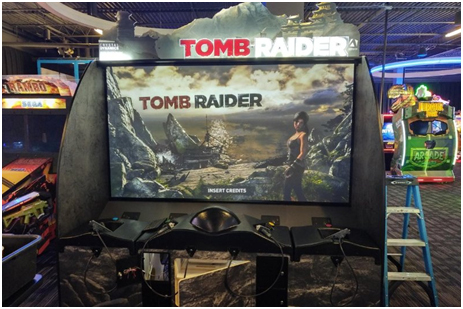 However, for those who tried out the game at your local FEC, and felt that they needed to get their hands on their very own Tomb Raider cabinet, today might be your lucky day. Adrenaline Amusements announced that the company would be producing smaller cabinets for those with a smaller budget and tighter space requirements. This means both smaller operators and potential collectors. The new cabinet preserves all the functions of the original, including 4-player co-op mode, as well as guns with motion sensors and force-feedback capabilities, and will only measure 65”. This means that, while players might need to squeeze a bit when playing the 4-player mode, the cabinet itself will be a much better fit in those tight spaces. ← Intellivision Amico: Bringing Family Fun, or Adult Entertainment?